Civilisation reached a high level in Egypt at an early period. The country was well suited for the people, with a fertile land thanks to the river Nile yet with a pleasing climate. It was also a country which was easily defended having few natural neighbours to attack it for the surrounding deserts provided a natural barrier to invading forces. As a consequence Egypt enjoyed long periods of peace when society advanced rapidly. By 3000 BC two earlier nations had joined to form a single Egyptian nation under a single ruler. Agriculture had been developed making heavy use of the regular wet and dry periods of the year. The Nile flooded during the rainy season providing fertile land which complex irrigation systems made fertile for growing crops. Knowing when the rainy season was about to arrive was vital and the study of astronomy developed to provide calendar information. The large area covered by the Egyptian nation required complex administration, a system of taxes, and armies had to be supported. As the society became more complex, records required to be kept, and computations done as the people bartered their goods. A need for counting arose, then writing and numerals were needed to record transactions. By 3000 BC the Egyptians had already developed their hieroglyphic writing (see our article Egyptian numerals for some more details). This marks the beginning of the Old Kingdom period during which the pyramids were built. For example the Great Pyramid at Giza was built around 2650 BC and it is a remarkable feat of engineering. This provides the clearest of indications that the society of that period had reached a high level of achievement. The Egyptian number systems were not well suited for arithmetical calculations. We are still today familiar with Roman numerals and so it is easy to understand that although addition of Roman numerals is quite satisfactory, multiplication and division are essentially impossible. The Egyptian system had similar drawbacks to that of Roman numerals. However, the Egyptians were very practical in their approach to mathematics and their trade required that they could deal in fractions. Trade also required multiplication and division to be possible so they devised remarkable methods to overcome the deficiencies in the number systems with which they had to work. Basically they had to devise methods of multiplication and division which only involved addition. Early hieroglyphic numerals can be found on temples, stone monuments and vases. They give little knowledge about any mathematical calculations which might have been done with the number systems. While these hieroglyphs were being carved in stone there was no need to develop symbols which could be written more quickly. However, once the Egyptians began to use flattened sheets of the dried papyrus reed as "paper" and the tip of a reed as a "pen" there was reason to develop more rapid means of writing. This prompted the development of hieratic writing and numerals. There must have been a large number of papyri, many dealing with mathematics in one form or another, but sadly since the material is rather fragile almost all have perished. It is remarkable that any have survived at all, and that they have is a consequence of the dry climatic conditions in Egypt. Two major mathematical documents survive. You can see an example of Egyptian mathematics written on the Rhind papyrus and another papyrus, the Moscow papyrus, with a translation into hieratic script. 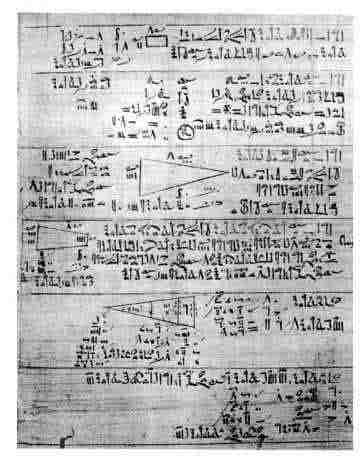 It is from these two documents that most of our knowledge of Egyptian mathematics comes and most of the mathematical information in this article is taken from these two ancient documents. The Rhind papyrus is named after the Scottish Egyptologist A Henry Rhind, who purchased it in Luxor in 1858. The papyrus, a scroll about 6 metres long and 1/3of a metre wide, was written around 1650 BC by the scribe Ahmes who states that he is copying a document which is 200 years older. The original papyrus on which the Rhind papyrus is based therefore dates from about 1850 BC. The Moscow papyrus also dates from this time. It is now becoming more common to call the Rhind papyrus after Ahmes rather than Rhind since it seems much fairer to name it after the scribe than after the man who purchased it comparatively recently. The same is not possible for the Moscow papyrus however, since sadly the scribe who wrote this document has not recorded his name. It is often called the Golenischev papyrus after the man who purchased it. The Moscow papyrus is now in the Museum of Fine Arts in Moscow, while the Rhind papyrus is in the British Museum in London. The Rhind papyrus contains eighty-seven problems while the Moscow papyrus contains twenty-five. The problems are mostly practical but a few are posed to teach manipulation of the number system itself without a practical application in mind. For example the first six problems of the Rhind papyrus ask how to divide nloaves between 10 men where n =1 for Problem 1, n = 2 for Problem 2, n = 6 for Problem 3, n = 7 for Problem 4, n = 8 for Problem 5, and n = 9 for Problem 6. Clearly fractions are involved here and, in fact, 81 of the 87 problems given involve operating with fractions. Rising, in , discusses these problems of fair division of loaves which were particularly important in the development of Egyptian mathematics. Some problems ask for the solution of an equation. For example Problem 26: a quantity added to a quarter of that quantity become 15. What is the quantity? Other problems involve geometric series such as Problem 64: divide 10 hekats of barley among 10 men so that each gets 1/8 of a hekat more than the one before. Some problems involve geometry. For example Problem 50: a round field has diameter 9 khet. What is its area? The Moscow papyrus also contains geometrical problems. Unlike the Greeks who thought abstractly about mathematical ideas, the Egyptians were only concerned with practical arithmetic. Most historians believe that the Egyptians did not think of numbers as abstract quantities but always thought of a specific collection of 8 objects when 8 was mentioned. To overcome the deficiencies of their system of numerals the Egyptians devised cunning ways round the fact that their numbers were poorly suited for multiplication as is shown in the Rhind papyrus. 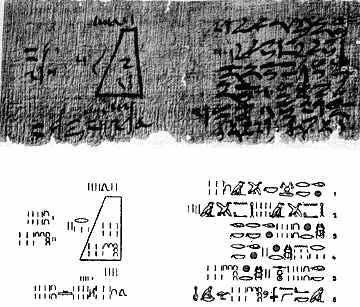 We examine in detail the mathematics contained in the Egyptian papyri in a separate article Mathematics in Egyptian Papyri. In this article we next examine some claims regarding mathematical constants used in the construction of the pyramids, in particular the Great Pyramid at Giza which, as we noted above, was built around 2650 BC. Joseph  and many other authors gives some of the measurements of the Great Pyramid which make some people believe that it was built with certain mathematical constants in mind. The angle between the base and one of the faces is 51° 50' 35". The secant of this angle is 1.61806 which is remarkably close to the golden ratio 1.618034. Not that anyone believes that the Egyptians knew of the secant function, but it is of course just the ratio of the height of the sloping face to half the length of the side of the square base. On the other hand the cotangent of the slope angle of 51° 50' 35" is very close to π/4. Again of course nobody believes that the Egyptians had invented the cotangent, but again it is the ratio of the sides which it is believed was made to fit this number. Now the observant reader will have realised that there must be some sort of relationship between the golden ratio and π for these two claims to both be at least numerically accurate. In fact there is a numerical coincidence: the square root of the golden ratio times π is close to 4, in fact this product is 3.996168. In  Robins argues against both the golden ratio or π being deliberately involved in the construction of the pyramid. He claims that the ratio of the vertical rise to the horizontal distance was chosen to be 5 1/2 to 7 and the fact that (11/14) × 4 = 3.1428 and is close to π is nothing more than a coincidence. Similarly Robins claims the way that the golden ratio comes in is also simply a coincidence. Robins claims that certain constructions were made so that the triangle which was formed by the base, height and slope height of the pyramid was a 3, 4, 5 triangle. Certainly it would seem more likely that the engineers would use mathematical knowledge to construct right angles than that they would build in ratios connected with the golden ratio and π. Finally we examine some details of the ancient Egyptian calendar. As we mentioned above, it was important for the Egyptians to know when the Nile would flood and so this required calendar calculations. The beginning of the year was chosen as the heliacal rising of Sirius, the brightest star in the sky. The heliacal rising is the first appearance of the star after the period when it is too close to the sun to be seen. For Sirius this occurs in July and this was taken to be the start of the year. The Nile flooded shortly after this so it was a natural beginning for the year. The heliacal rising of Sirius would tell people to prepare for the floods. The year was computed to be 365 days long and this was certainly known by 2776 BC and this value was used for a civil calendar for recording dates. Later a more accurate value of 365 1/4 days was worked out for the length of the year but the civil calendar was never changed to take this into account. In fact two calendars ran in parallel, the one which was used for practical purposes of sowing of crops, harvesting crops etc. being based on the lunar month. Eventually the civil year was divided into 12 months, with a 5 day extra period at the end of the year. The Egyptian calendar, although changed much over time, was the basis for the Julian and Gregorian calendars.